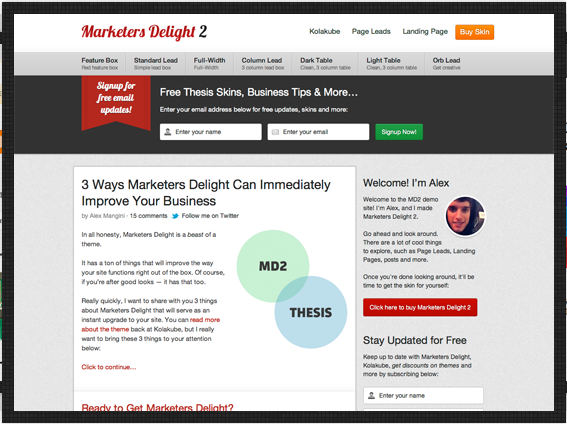 This web site is built with a combination of Thesis theme and a theme skin called Marketer’s Delight made by Kolakube. Why use a theme and a skin? Thesis is customizable but frankly when you customize it yourself your audience can likely tell that YOU customized it. It looks like a Thesis site. Thesis isn’t ugly but it certainly isn’t dynamic looking. With Marketer’s Delight skin by Kolakube I can customize the site to look very unique. How hard is it to customize the skin? Kolakube is amazing when it comes to customer support. Their forums are ridiculously helpful. If you’re a newbie or you’re super techie like me you’ll learn something in the forums. Remember that there is great value in having a community of other people who have asked questions. They have likely already asked the question you’ve got so you won’t have to wait for the answer in the forum because it’ll already be there. The power of Marketer’s Delight is that it creates a ton of buttons, widget and layout options very easily. The email opt-in box at the top of my main page is built in to the theme. The widgets in the sidebar and the ability to make a page full width or create a sales page layout are as easy as checking a box. The reasons most themes look great is because a designer made them. Marketer’s Delight allows me to make a great looking theme without being a coding genius. It is difficult to install a theme and a skin? Installing the skin is more difficult than installing the theme (Thesis) but again, Kolakube walks you through it. I will also be creating a “how-to” video and posting it in side the Take Permission Community in the next week so if you join the community at any level you’ll have access to that tutorial. Again, Kolakube does a great job of giving instructions and support on installing the skin as well and that’s included in the cost of the theme. Thesis costs $87 for one site or $164 for the developer’s option, which allows you to install it on as many sites as you own. Marketer’s Delight skin costs $67. I have used other options for my themes including Elegant Themes, which is a great option. The key to cost is knowing what your time is worth. I paid $250+ to have a great theme and skin because it provides much more value than the $250 I spent. In my opinion a good theme is like a gym membership. If you use it, it’s worth it. Thesis and Marketer’s Delight both have affiliate programs so when someone asks you how you got your site to look so good you can make money by referring them to your affiliate links. That’s exactly what I’ve done in this post. It’s not the only reason to get the theme or skin but it certainly helps!